You may be surprised to find out that there is perhaps less .999 fine silver bullion in existence today than .999 fine gold bullion. Although gold occurs less often in the ground, we humans do not use the same percentage of gold (9% of annual supplies) in industrial applications as often as we use silver (about 60% of annual supplies). At the time of writing this article, gold bullion is currently 70 times more valuable than silver bullion in terms of its US dollar price. According to mining experts silver ore is mined from the Earth’s crust at about 8 parts silver to 1 part gold. These points do not necessarily mean that silver should be valued at a slimmer ratio, we state it to make the point that silver, like gold, is indeed a very rare precious metal with a long history as money and a store of value. According to silver industry analysts, at the end of 2015 there were some 2.3 billion ounces of identifiable .999 fine silver bullion the vast majority of which are owned by investors in silver vaults and bonded silver warehouses. What these figures do not take into account are aggregated silver bullion coin and bar sales and ownership amongst private investors who directly safeguard their metals or store in non-transparent bonded warehouses. In the 1980s, many government silver bullion coin programs were launched and since the 2008 financial crisis, many private mint bullion bar and round makers have helped fill in the surging demand gaps that sovereign government coin programs could not satiate. The vast majority of this modern .999 fine silver bullion (coins, bars, and rounds) remains and has not yet been recycled or used up in the world’s annual +800 million ounce jewelry and industrial silver demand. 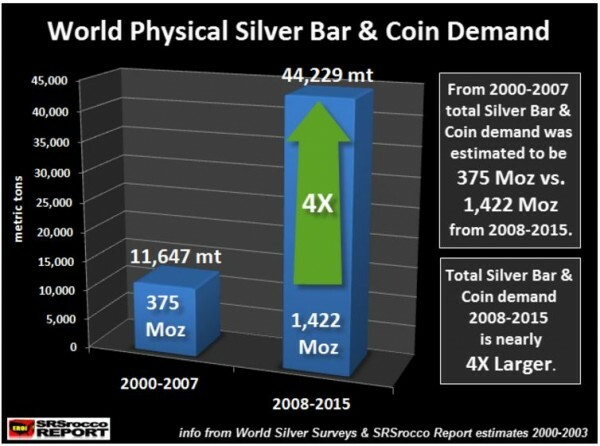 Although much of the world’s physical silver bar and coin demand is reported within transparent custodial vaults, we presume a large portion of this silver remains in silver investor’s hands and in non-transparent non-bank storage accounts. Given accessible industry data, one can presume there are some 3 to 3.5 billion ounces of .999 fine silver in the world. Roughly ½ troy ounce per living human being. Unlike gold, silver is not heavily hoarded by government endorsed central banks. As of March 2017, the World’s Official Gold Reserves are 1,070,363,520 ounces (about 16% of the 193,000 tons of gold ever mined). One can assume out of the remaining +5 billion ounces of above ground gold not in central bank vaults, roughly half are in close to .999 investment grade form (private bar and coin hoards). Thus the gold to silver investment grade above ground supplies are nearly 1 oz to 1 oz in 2017.